A letter of condolence from Smith-Holland Brokerage to Chas. F. Cates & Sons regarding the death of S. Baddour. An act to designate the Post Office at 200 N. William Street in Goldsboro, N.C. as the "Philip A. Baddour, Sr. Post Office." A letter of condolence from P.B. Smith in Charleston, S.C. regarding the death of S. Baddour. A letter of condolence from P.B. Dexter and Son in Columbus, G.A. regarding the death of S. Baddour. A newspaper article announcing the death of S. Baddour and listing his accomplishments throughout his life, including his immigration to the United States. 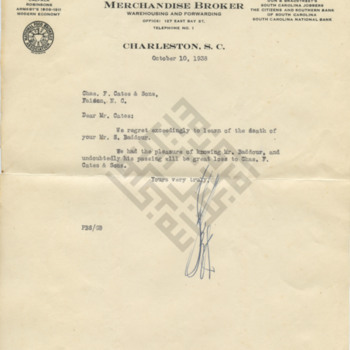 A letter of condolence from the Bobbitt Brothers Wholesale in Faison, N.C. regarding the death of S. Baddour.